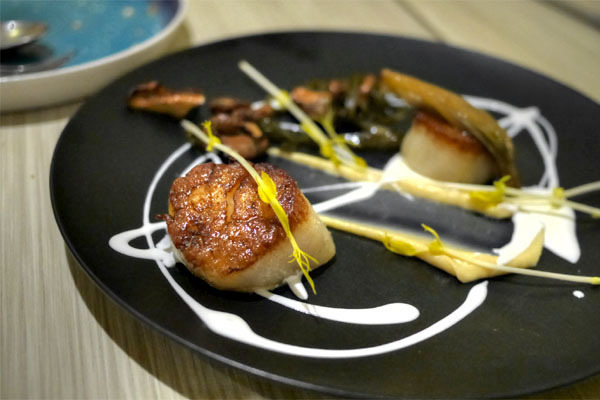 The most ambitious restaurant Koreatown has seen in a long while debuted recently on June 13th. 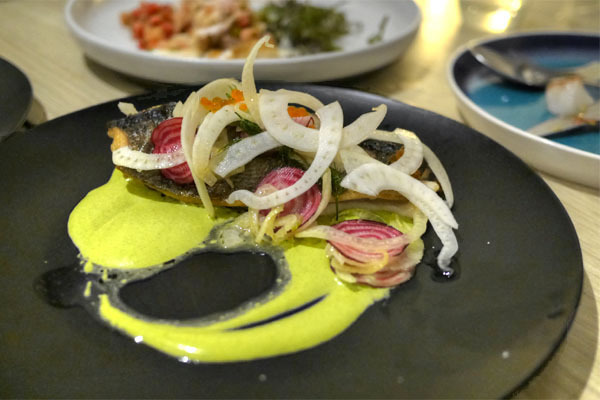 Named after the patron saint of cooks, servants, and other hospitality professionals, Saint Martha aims to present creative, modern American cuisine, which is sort of an uncommon sight around K-Town. 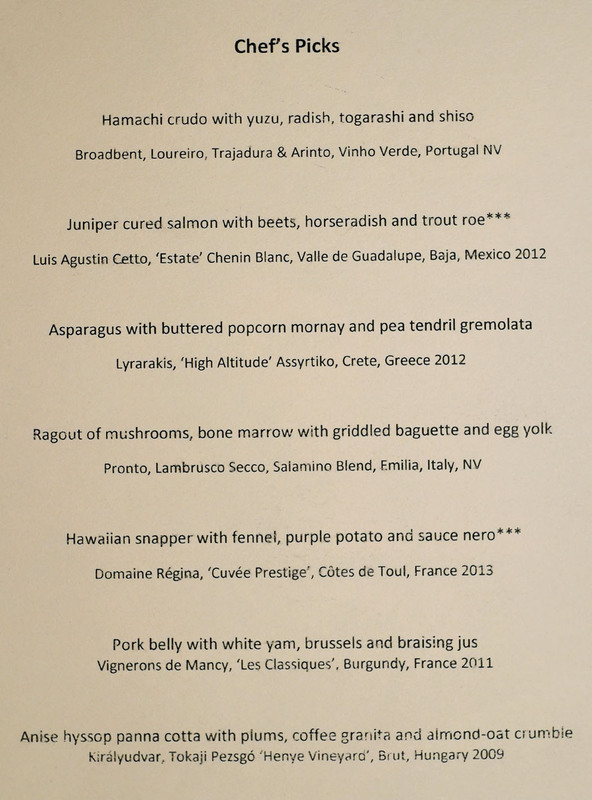 The restaurant is the work of Ellen and Peter Picataggio (the Farmer's Daughter hotel and adjoining restaurant TART, Surftides and Bel-Aire Inn Express in Lincoln City, Oregon), Jim Hustead (The Foundation Hospitality Group with Eric Greenspan), and Chef/Partner Nick Erven. About the Chef: Born in Riverton, Wyoming, Erven moved to Fresno during his childhood years, and played in punk rock bands throughout high school and his college years at Fresno City College (where his father Chuck was a professor of theater). He eventually enrolled in the California School of Culinary Arts in Pasadena, and interned at EM Bistro near West Hollywood during this period. Upon graduating, Erven secured a gig at David Haskell's BIN 8945, then later left LA for Portland, where he worked at tapas joint Lolo for a year. He soon returned to SoCal, landing a position at Biggs in Long Beach, where he first met Hustead, one of the co-owners there. 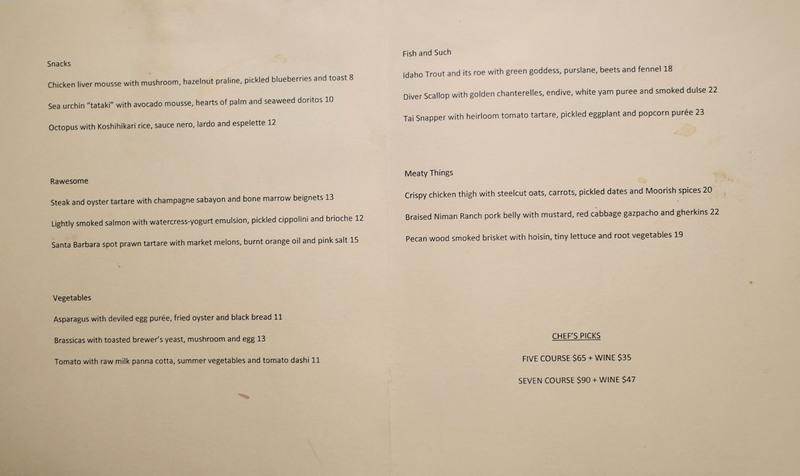 After Biggs' shuttered, Erven began cooking under mentor Seth Greenburg at The Penthouse at The Huntley Hotel, where he eventually became Chef de Cuisine. From there, he moved to MessHall in December 2012, replacing opening chef Keith Silverton. Erven stayed until the following July, when he would decamp and become part of the team at TART, where Erven first met Mary Thompson, Saint Martha's GM and Sommelier. 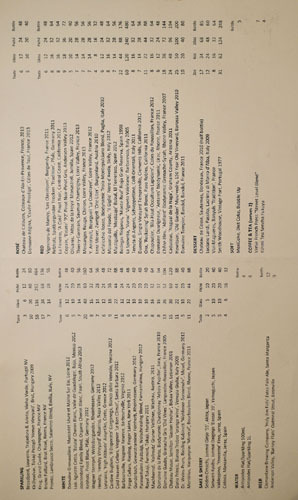 Prior to TART, Thompson worked various managerial positions at Rivera, Wokcano, Chaya Downtown, and the ONE Group, as well as at dB Bistro Moderne, Telepan, and Spice Market in New York. Saint Martha occupies the strip mall address of the old Isa Ramen Izakaya-slash-Seobu Gamjatang (Mapo Jip), though the interior has been completely revamped by the Picataggios, in collaboration with BAM Design Lab. The place has got a sort of modern-vintage with religious overtones vibe, the dining room seating 32, and the kitchen bar another six. 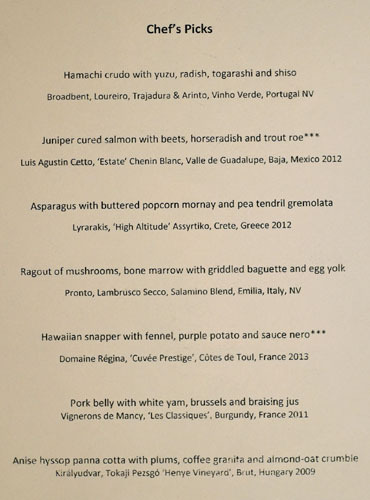 Erven's menu at Saint Martha veers what you might call Cal-Modern, with à la carte selections divided into five logical sections of three items each, though the Chef has recently instituted a tasting menu option as well (five courses for $65, or seven for $90). 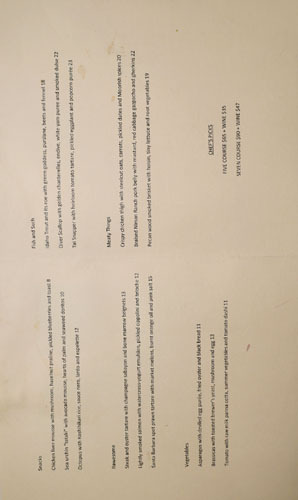 We, however, chose to run the gamut and order everything on the menu. 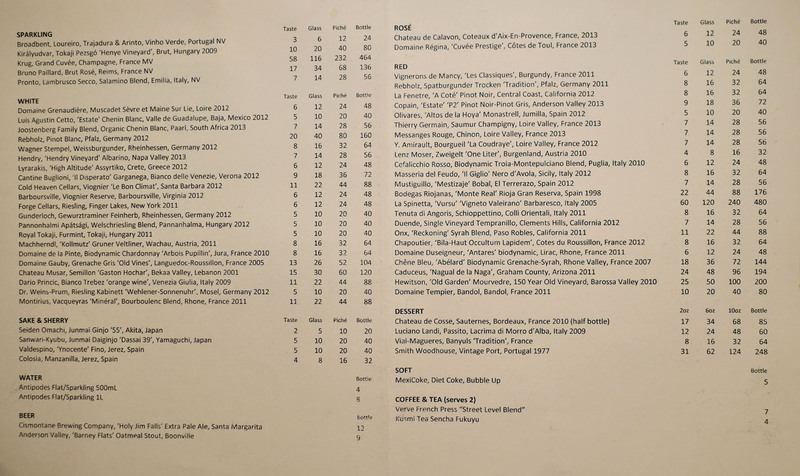 To drink, expect around 50 wines by Thompson, each available by the taste, glass, pichet (carafe), or bottle thanks to the use of a Coravin system. Corkage was waived this evening. Click for larger versions. 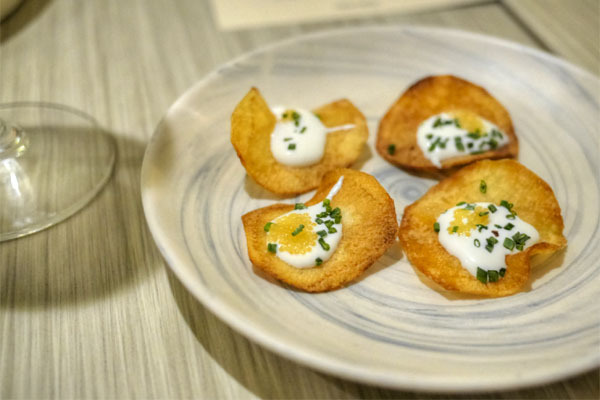 We commenced with an amuse bouche of potato chips topped with whitefish roe and crème fraîche. They were fun, tasty little bites, the salty roe/potato working hand-in-hand with the lush cream while chives perked things up on the finish. 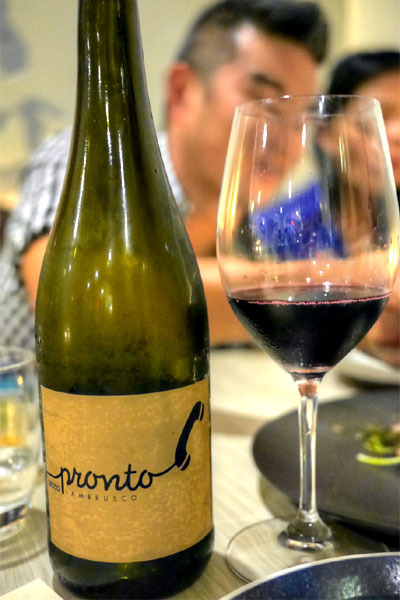 Before getting into the beers we brought, we ordered up some bubbly in the form of the Pronto, Lambrusco Secco, Salamino Blend, Emilia, Italy, NV [$56]. It was a festive sort of sparkler, enticing and almost jam-like on the nose, while taste-wise, you got plenty of fruity, floral notes with a counterbalancing bitterness toward the end. Just about the closest thing you can get to adult grape juice. Our first plate was the sea urchin, probably one of Saint Martha's signature dishes by this point. 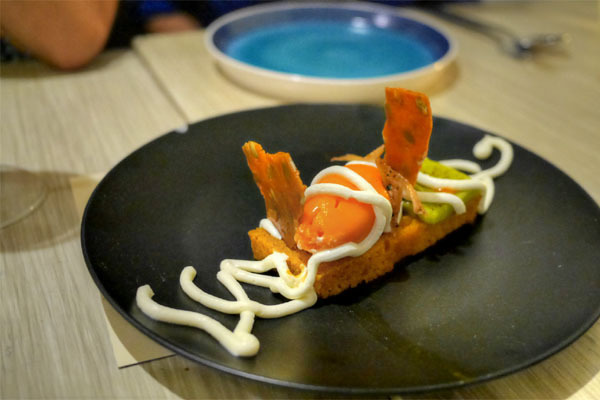 It was damn tasty, with the creaminess of the roe melding beautifully with the avocado, forming a luxurious combo that was finished by a touch of heat. The best part though? 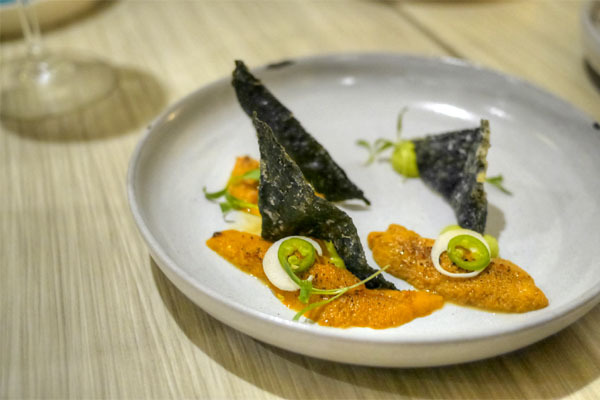 Those "Doritos," which imparted not only crunchiness, but a hit of umami that recalled the classic Japanese pairing of nori and uni. 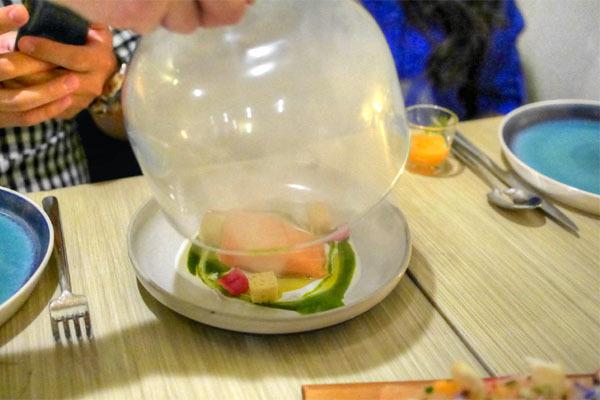 When I first saw this dish making its way across the dining room, I figured it for some ice cream dessert. It really did look like ice cream though, even from close up, and its consistency wasn't that far off either. 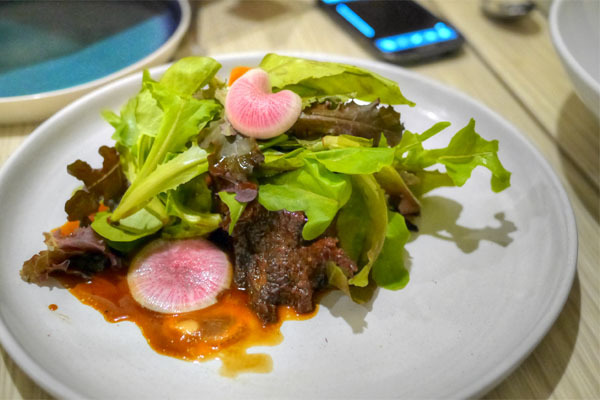 In terms of flavor, it was obviously completely different, showcasing the creeping sort of earthiness that you'd expect from liver, tempered by the sweetness of those hazelnuts and just a pinch of salt. 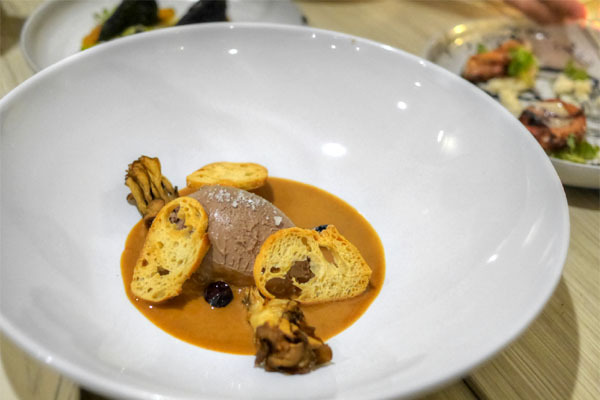 The mushrooms were an unexpected, but effective addition, providing counterpoints to the mousse both in terms of texture and taste. I will say that the quenelle was the largest I've seen, so a smaller portion probably would have worked better (there weren't enough accompaniments to pair with the liver). 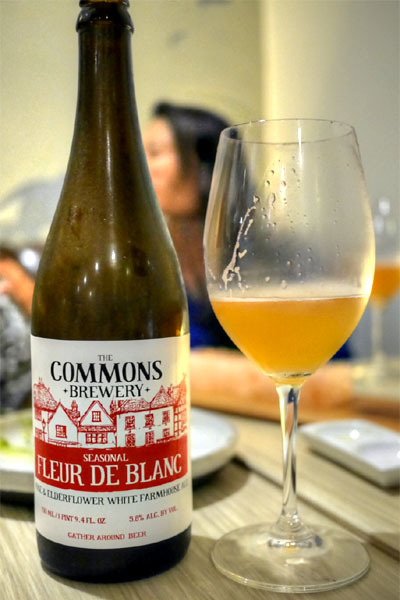 Moving into the beers now, our first was the 2014 The Commons Fleur De Blanc, a farmhouse-style ale brewed with rosehips and elderflower. I got funky, crisp, and bitter on the palate, with a finish that conveyed the delicate floral character I was looking for. 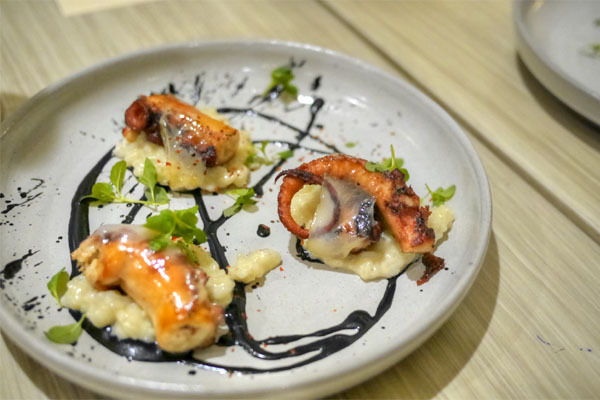 I'm a sucker for octopus, and Erven's delivered, coming out appropriately tender and imbued with a great char, its sweet-saline flavors augmented by a draping of salty lardo. 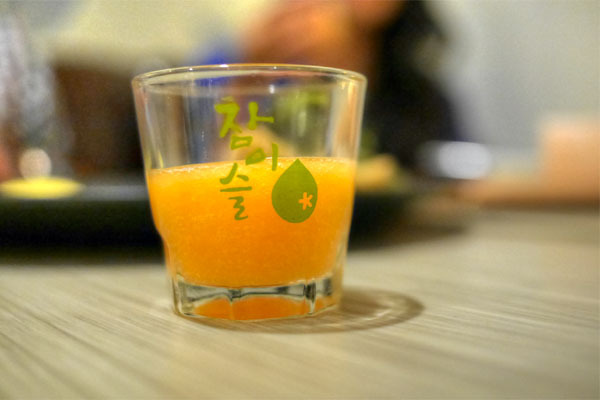 The Koshihikari rice utilized here was key, effectively evening out the whole experience. Very nice. 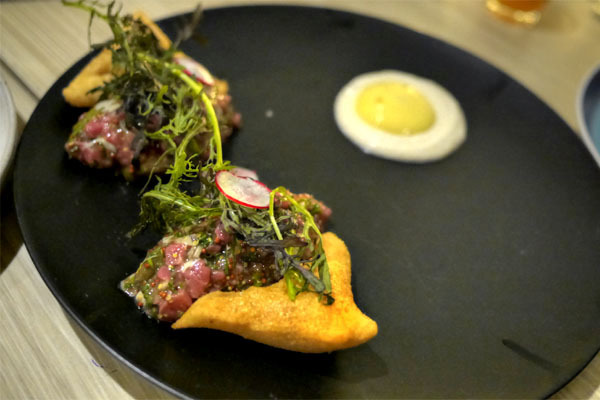 The tartar was also quite something, the beef enhanced by the focused brine of oyster, yet balanced by the greens and mustard, not to mention that awesomely tangy horseradish. My favorite thing, though, was the bone marrow beignet, rich, crispy little buggers that oozed marrow upon mastication. 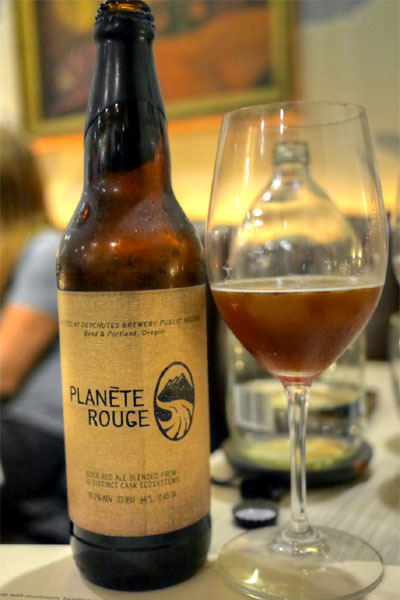 Our next brew was the 2014 Deschutes Planéte Rouge, a limited, one-time-only, multi-barrel-aged, brewery-only release done in the sour red style and "blended from 13 distinct cask ecosystems." I was enamored with it and its tart, vinegar-y, fruity base of flavors (that actually recalled suan mei), joined by a palpable intensity and boozy quality, along with a chocolate-y tinge toward the rear. The salmon was a highlight for me, teeming with a delicate smokiness that really meshed flawlessly with the inherent fattiness in the fish. I enjoyed it alone, but also appreciated the zing of the watercress-yogurt and pickles, as well as the crunch of those croutons. 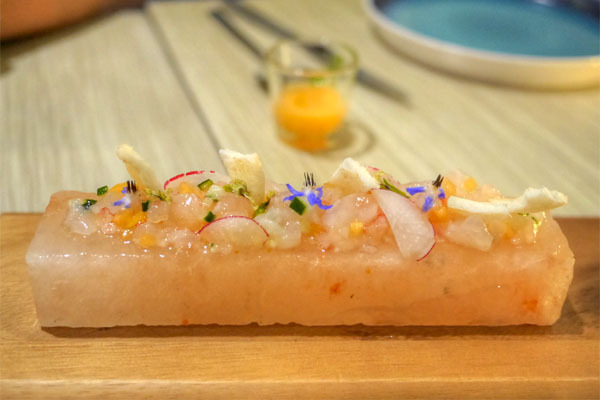 What followed was a time-sensitive course, with the spot prawns ostensibly getting saltier and saltier the longer they sat on the block of pink salt. We probably let them sit too long, as they definitely leaned salty, though the sweetness of the melon soup worked wonders in evening things out. Lovely crunch from the "shrimp chips" here, too. 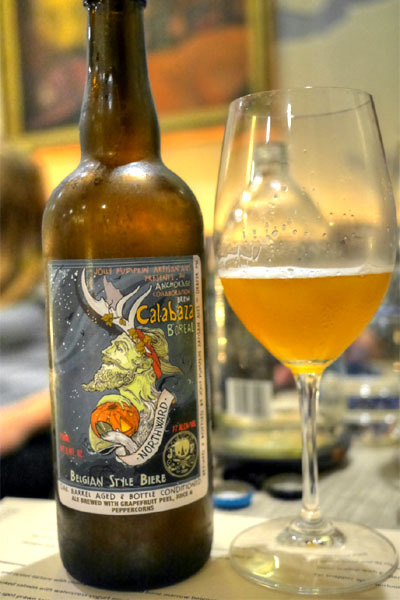 We went back to a saison with the 2014 Jolly Pumpkin Calabaza Boreal, an oak-aged collaboration beer with Anchorage Brewing made with grapefruit juice and zest as well as peppercorns. It was pretty great, all funky and hoppy and slightly vinous, with a fantastic presentation of grapefruit character that I really enjoyed. 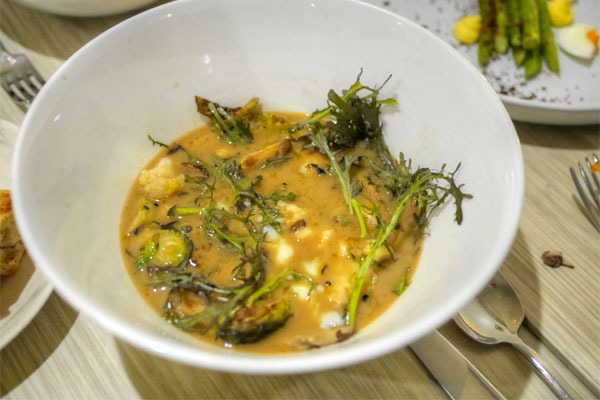 Asparagus was nice, the astringency of the vegetable on proud display here, set against the lushness of the egg while the oyster added a great blast of savory brine to the dish. I was a fan of the black bread here as well, which provided an earthy, spicy quality that really closed out the dish. Brassica is probably my favorite genus of plant ever. Here, various members of the group were presented in all their bitter glory, paired with a deeply-flavored, homey sort of broth augmented by the richness of mushroom and egg. Tasty alone, and even better with a bit of that crusty bread. 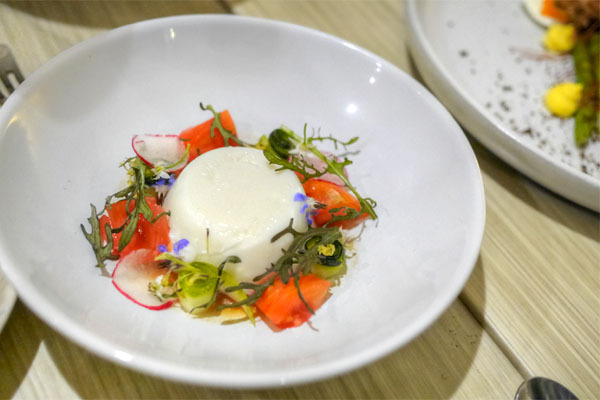 A milk panna cotta was mild, with a delicate, lactic sort of piquancy to it that made sense with the sweet-tart tomatoes. 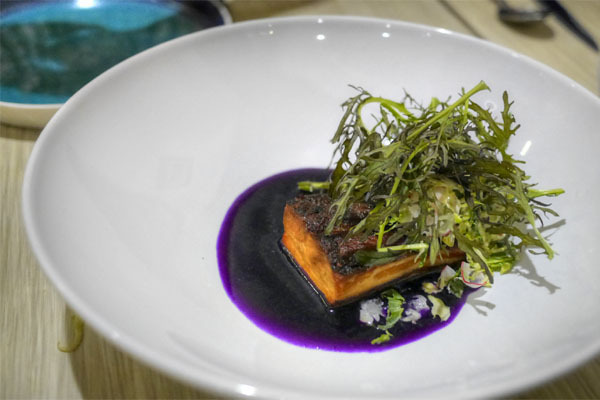 The dashi added a much-appreciated gravity to the dish, but I would've liked even more acidity, more herbaceousness on the plate. 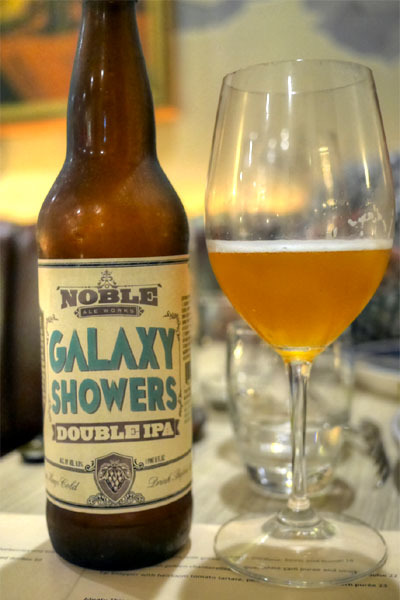 The 2014 Noble Ale Works Galaxy Showers was the newest entry in the brewery's line of single-hop IPAs. Perhaps more bracing than its brethren, this one was rather intensely piney and grassy, its bitterness cut by a subtly sweet, citrusy component. 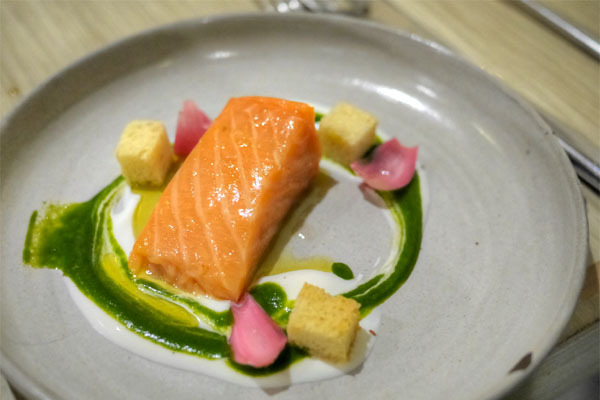 Trout was intense in flavor, a heady-tasting fish that was softened by the application of tangy green goddess and cuts of crunchy, raw veggies. I wanted a crispier skin here, however. 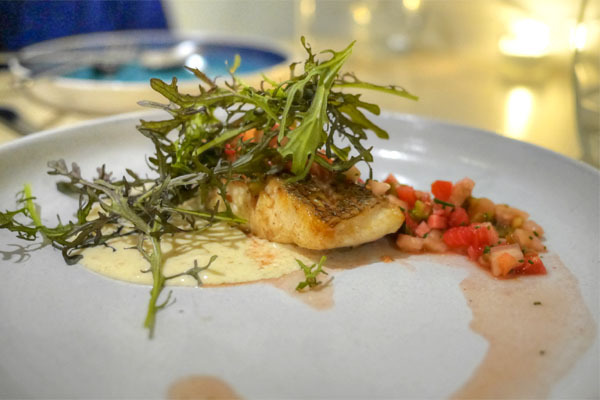 The snapper was lovely, with a wonderfully savory, crisp skin and a refined flavor profile that paired swimmingly with the acidic brightness of the accompanying tomato. Our final seafood dish brought us scallops, expertly seared examples with some great caramelization. They were quite strongly flavored, especially so when taken with the chanterelles, so the endive and yam were key in making it all sing together. 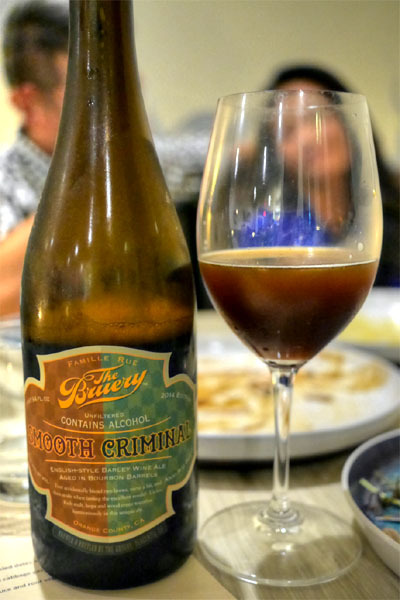 Now for something heavier: I popped a bottle of the 2014 The Bruery Smooth Criminal, a blend of English-style barleywine aged in bourbon barrels and a saison. It was a potent beer to be sure, full of dark fruit, malt, caramel, oak, and booze, with a wine-like quality to it and the faintest hint of farmhouse character. At this point, we moved into the meatier courses. Pork belly was delightful, a deft balance of lean and fat topped with a great bit of skin. The bitter mustard greens and sour pickles worked as excellent counterbalances to the pig, and I was taken aback by how vibrantly purple that gazpacho was. 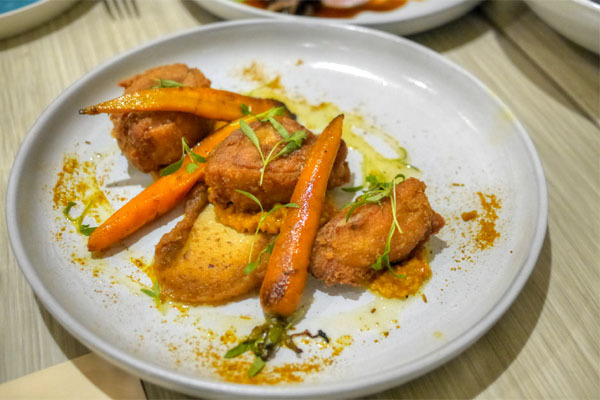 I was impressed with the chicken, the bird arriving super juicy, savory, and crisp, expertly mated to the sweetness of carrot while the spices added a great finishing touch to the plate. In our final savory, brisket was done up with some Asian-y flair, its dark, sweet-n-savory flavors deeply satisfying, yet adroitly countered by the veggies present. My only concern here was that some parts of the brisket went overly dry. 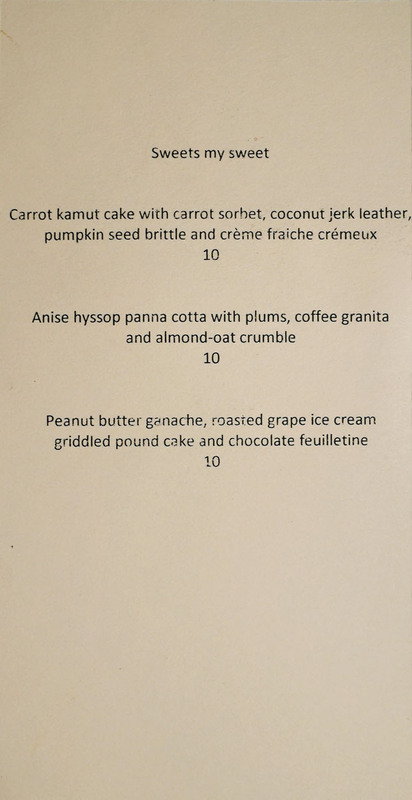 Saint Martha's dessert menu continues the trend of three dishes per section, and yes, they do have a pastry chef I'm told. Click for a larger version. 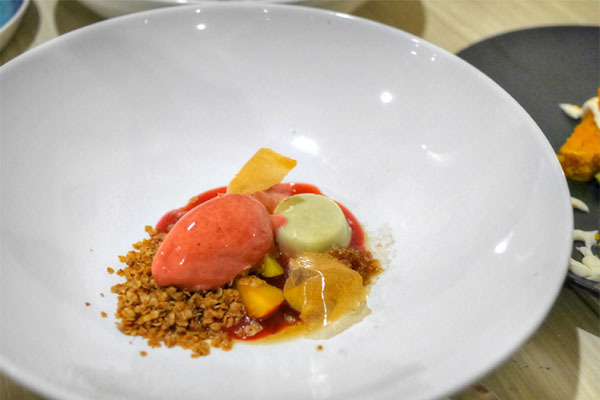 A light, bright sort of dessert, this one presented the spicy, anise-y panna cotta against a backdrop of sugary plum and delightfully nutty crumbles. I didn't get much from the coffee, though. 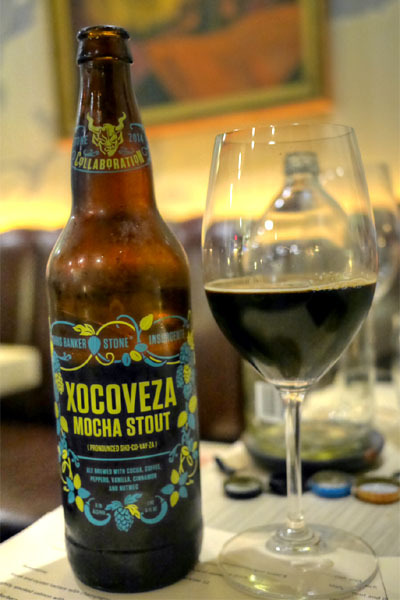 The final beer of the night was the 2014 Stone Brewing Chris Banker/Insurgente Xocoveza Mocha Stout, and it definitely went "desserty." Designed to recreate the flavors of a Mexican hot chocolate, the milk stout was brewed with chocolate, cinnamon, nutmeg, chili pepper, and coffee. I rather enjoyed it, with its base of classic stout-y nuances intermingled with a fantastic bit of sweet spice that really satisfied. 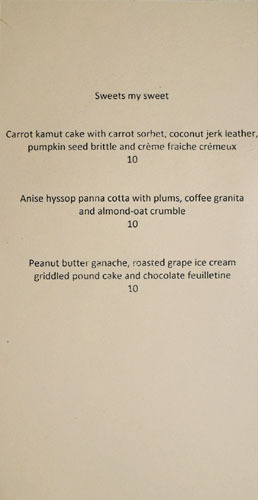 Our next dessert seemed somehow apropos given that autumn was upon us. 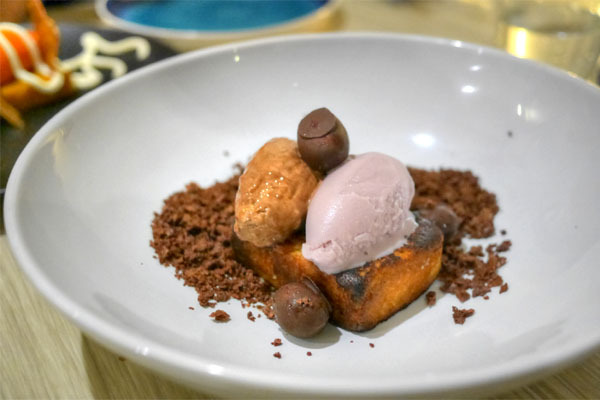 You had the sweetness of carrot and pumpkin, joined by a superb spice and the crémeux, but the showpiece was that "leather," which conveyed an unexpected savory-spice to it that served as the exclamation point to the dish. I was never a fan of peanut butter and jelly growing up, but really enjoyed this rehash of the classic, which displayed the essence of PB&J over a base of fantastic pound cake. Loved those Cocoa Pebbles-esque crumbles, too. 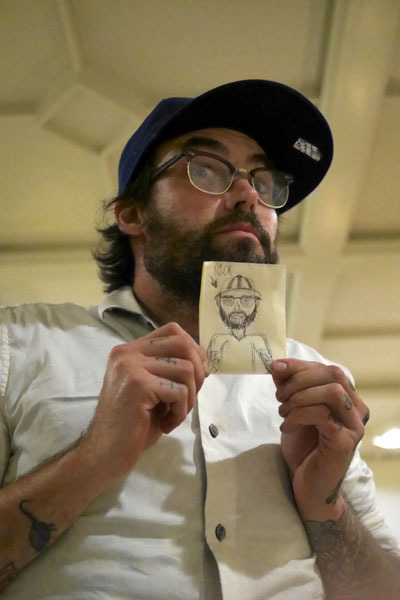 Chef Nick Erven, with portrait. 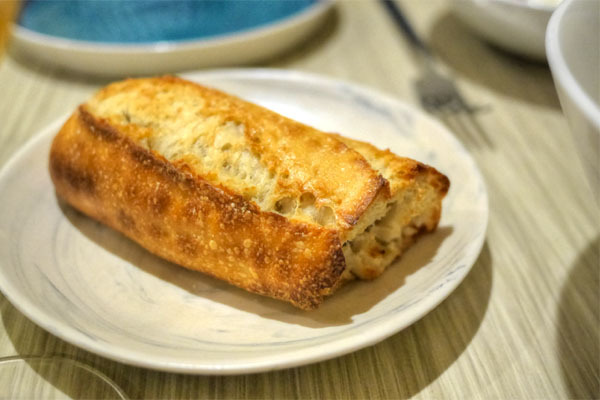 Saint Martha has been widely heralded as the most ambitious restaurant to hit K-Town since Josef Centeno's Opus, and I would tend to agree with that sentiment (with apologies to Commissary). 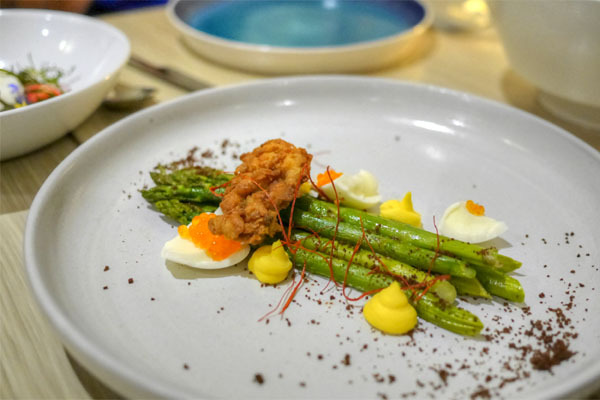 Erven's cookery presents an invigorating take on modern American cuisine, and there's a great bit of creativity, whimsy, but also seriousness going into the plates. It's just the type of place that the area needed, and I'm very curious to see how the cooking evolves here. Hopefully they'll manage to stick around for a while. 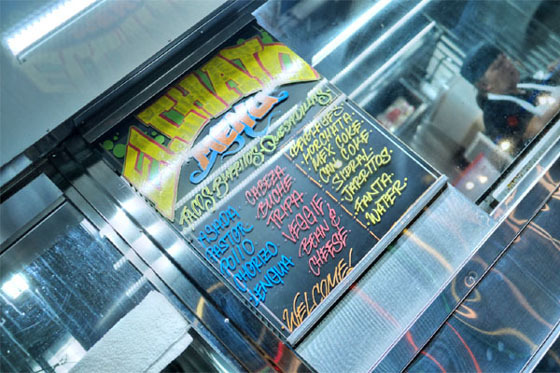 And on the way back, a stop at the popular El Chato Taco Truck. It was my first time eating there, actually. Pretty good. Awesome to see the beers continuing, and rather prominently. Can you recommend some great bottle stores? What was better, Saint Martha or El Chato? 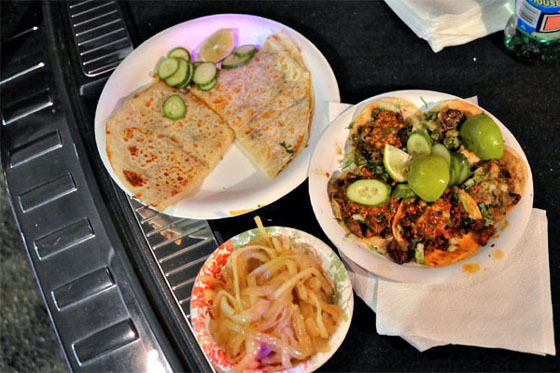 Frankly the $5 plate of tacos looks more appealing than a lot of those dishes! Collier: Yeah, I was a bit skeptical at first, but I began seeing a lot of positive response, including from you, so I put it on my list. Really glad I made it out. Anon: Oh yeah, they'll be continuing for a while I imagine. As for bottle shops, I usually use Icon in Cypress, California Heights in Long Beach (same owner as Icon), Mr. K's in Placentia, and Ramirez in East LA. Anon: Here, easily, and not just because we're talking about a taco truck as competition. The food at El Chato was tasty, and perfect for late night dining, but didn't seem as "special" as its hype would indicate. Looking at my timestamps, the amuse hit the table at 8:48 while the last dessert arrived at 11:43, so that's three hours. I wouldn't count on getting out of here under two hours if you get the entire menu like we did. Finally managed to get here myself, full report (with pics) here. Very creative chef, IMHO. Friends the next question arise on all of our minds is How to install IMO for PC?. Yes, of course, it is true. There is a reason behind this to install and Download IMO APK for Windows PC.